Is your Krups Espresso Frothing Nozzle missing or leaking all over your counter top? You may need a new frothing nozzle. 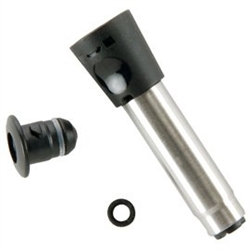 This parts kit includes the removable frothing nozzle, the mounting hub and seal. This Krups MS-623107 espresso parts kit replaces the MS-622268 frother used on several espresso models, and offers a stronger mounting scenario than earlier designs. Use this part to re-outfit your espresso machine for optimum steaming pressure and frothing / foaming performance. XP2240, XP224050/1P0, XP2280, XP228050/1P0, XP228050/1P1, XP4200, XP420050/1P0, XP420050/1P1, XP4600, XP460050/1P0, XP4600501P1, XP5220, XP522050/1P1, XP522050/1P2, XP5220501P3, XP5240, XP524050/1P0, XP5240501P1, XP5240501P2, XP5280, XP528050/1P1, XP5280501P2, XP528050/1P3. Krups Stainless Steel Frothing Pitcher 12 Oz. Krups Artese Filter for Espresso Makers 088 Krups Espresso Machine Flow Meter MS-0A01717 Krups Stainless Steel Frothing Pitcher 20 Oz.